Soft, supple and durable, the Daisy is a fun yet practical ballet shoe. 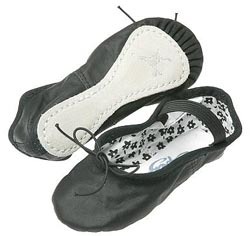 Perfect for dancers of all ages, this ballet shoe is made of soft, durable leather. Featuring ballet shoe first, this shoe has a printed daisy hung lining and a satin "This belongs to" name tag. A new classic, the Daisy has a drawstring that is secured at the back so it will not pull through and pre attached elastic. Full suede sole. Available in toddler and infant sizes 6-9.5 with medium (standard) width.